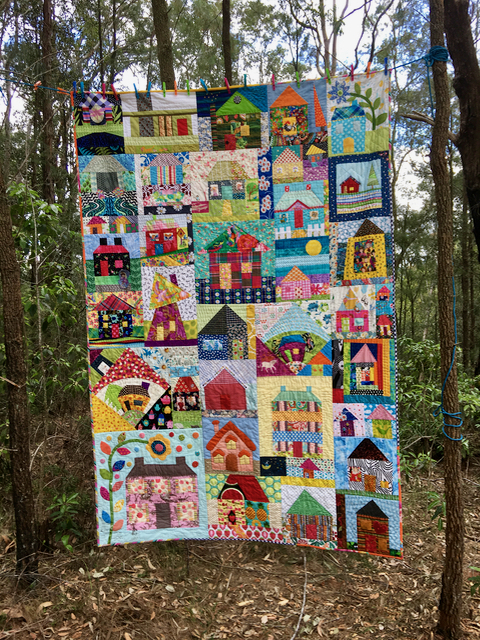 Happy Days in Daisy Town - A finished quilt. Finally, after showing you lots of houses, it's time to show you how they all came together in a quilt. 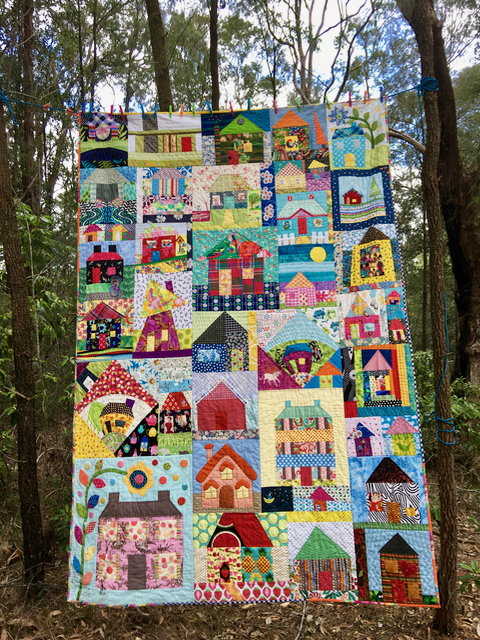 I admit I dithered over hot to put the blocks together because I felt as though I had to do something super special because so many people had contributed to the quilt with their beautiful house blocks. Some of the options I played with were pieced people or trees amongst the houses. I thought it could be fun to add a quote with pieced words, or a quirky border of some sort. Maybe I should use one unifying fabric or colour as sashing between all the blocks. In the end I realised I was overthinking it - it was the houses themselves that made this project special. It didn't need fancy things added that would take away from the beautiful pieces people had sent me. So keeping the focus on the blocks. I added joining strips here and there, and made some cubby houses for areas that were bigger. It was like playing with a giant puzzle. It came together without too much trouble. The main thing I added was a flower in the bottom left corner on Karen's block to tie in with Kelly's blue daisy in the top right corner. The flowers are by no means matching but they do add just the littlest bit of coherence to the quilt. 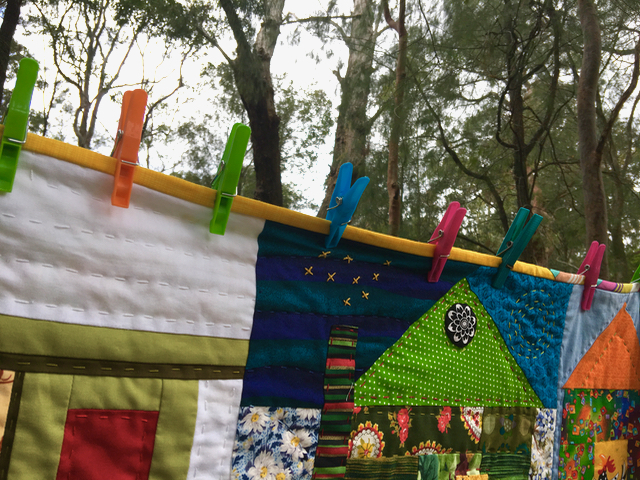 I also hand quilted the quilt with lots of different coloured perle8 thread with different patterns to suit the different houses. You have to love a husband that spends his day off messing around with ropes and ladders to help me get a photo of a quilt amongst trees. I hadn't sewn on a hanging sleeve so colourful pegs had to do. However it a gust of wind came along and blew the quilt around. Before long some of the pegs flew off! But it made me think the quilt was trying to show off it's backing. So here's a photo with a tree in the way... as you can see I used a mix of fresh green and blue fabrics. I love raiding my stash to make pieced backings. 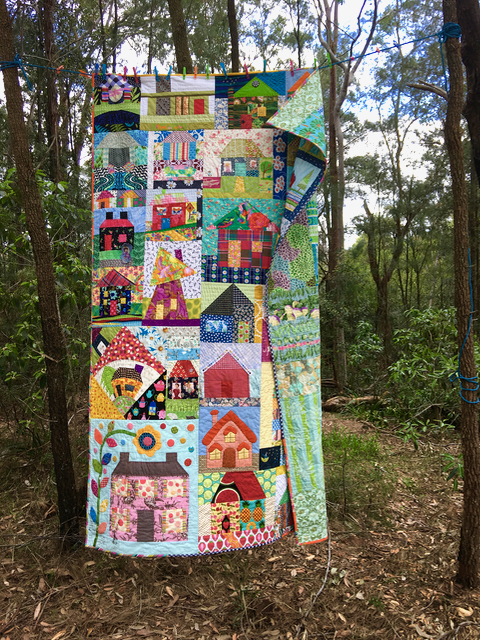 Some of the houses had special placements in the quilt. These two houses are made by Marg and Shay. They are best friends who met through blogging. In real life they live on different sides of Australia but in Daisy Town they're neighbours. I put LeeAnn Nifty's quilt in the middle of the quilt because her house was the beginning of the quilt. Other blocks just looked right together. When I invited people to make a house I said there were no rules with the blocks: no particular style, colour or even size restrictions. 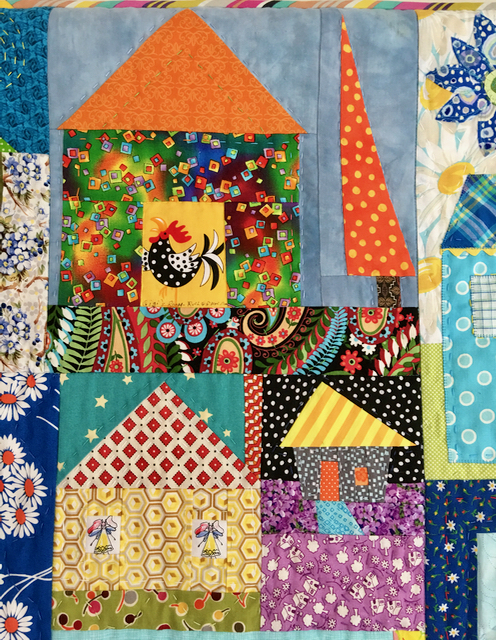 Seeing the quilt gives you an idea of the range of different sizes and styles. It one of the things I really like about the quilt. As for the name - I think Happy Days in Daisy Town says it all. Happy Days in Daisy Town by Rachaeldaisy, 90 x 60 inches. 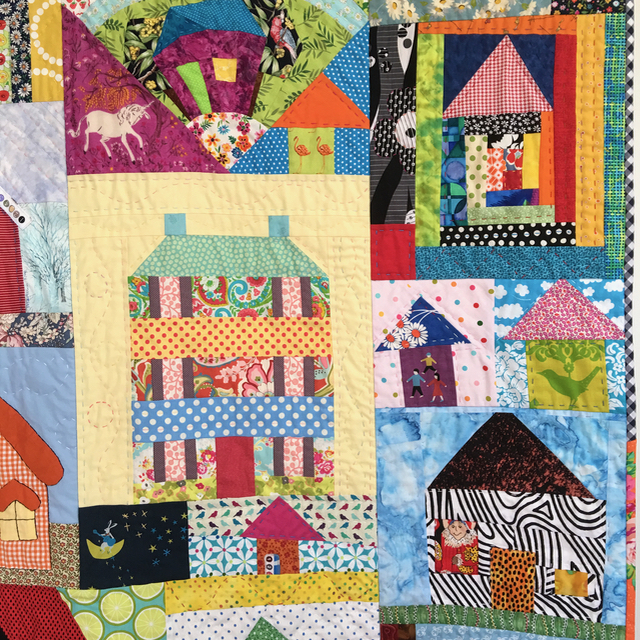 Thanks to all of the wonderful people who contributed to this fun quilt, and thank you to all the people who have followed along reading about each of the houses. I hope it meets your expectations. If you're new to this project you can jump back in time to previous posts to read more here. What a wonderful quilt this has turned out to be! You will have loads of fun looking at each of those happy houses and remembering the friend who made it for you. And you will be wrapped in their quilty love. 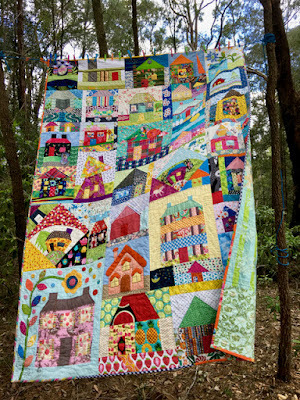 O what a fantastic quilt, love all the houses, so colorful. What a visual treat you have created Rachael! Of course it meets expectations- its delightful! 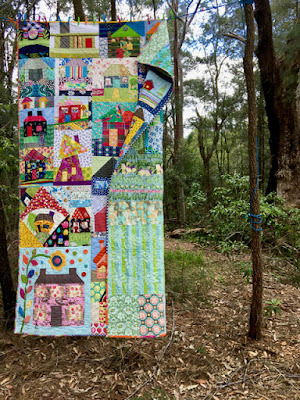 Wow Rachael, this is a very special quilt and it looks amazing. How lucky are you to have all these friends that have sent you a house? You have done a great jobs putting all the houses together to form a beautiful little town that I am sure you be so lovely to live in. 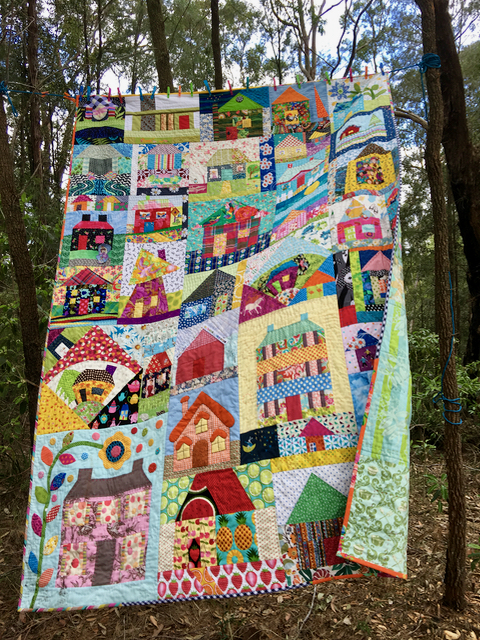 Lots of different houses with different colors in this quilt make it sooo gorgeous ! I'm loving it Rachael ! And the back is beautiful too, like a second quilt ! Congratulations for this finish ! I've so enjoyed the house to house journey Rachel! The creativity is so uplifting and joyful. You've put it together beautifully. Just love it ! Oh how scrumptious! Yes a perfect name to perhaps the friendliest quilt ever! All the details will just keep on giving you fun, won't they? I love it! Absolutely delightful! Its fun to see your friendship village all together. The pieced back is WONDERFUL! 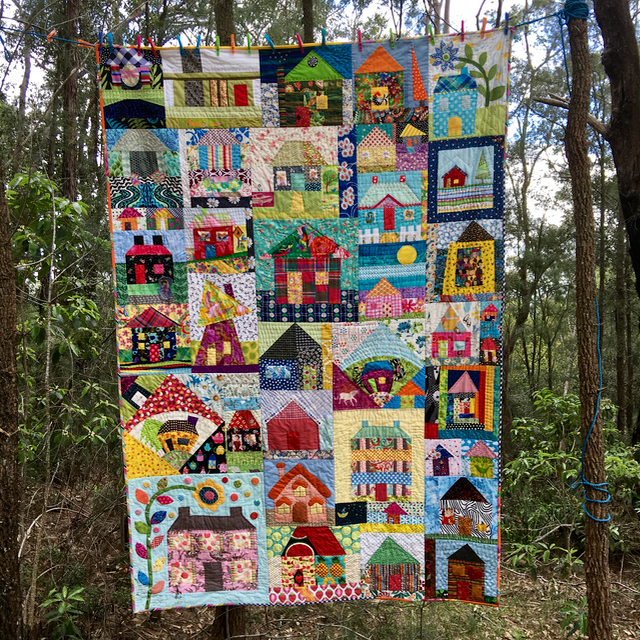 This happy village makes us smile, even when you try to hang it! What a beautiful top too! Really, really great quilt! It is wonderful to see the whole quilt and the back. Great name too BTW. 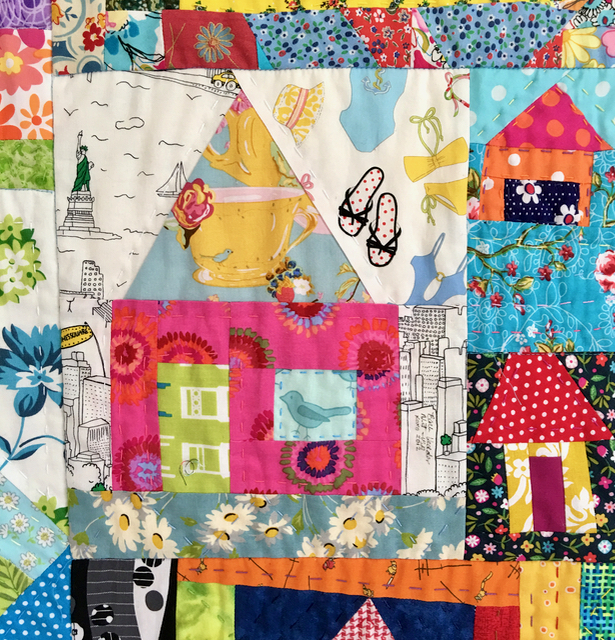 I am so happy that you previously posted close up photos of all the blocks and that you told the quilt's story. Yea!! It looks so happy, so friendly, so YOU surrounded by many of your quilting buddies from all over the world. I'm really happy to have a block in it. You have honored every contribution with its place and your hand stitching. Wonderful quilt!! What a gorgeous neighborhood! Letting the blocks speak for themselves was a great choice. I love the mix of all these fabrics and house styles. Great job! This turned out just lovely Rachael! I love the challenge of figuring how to put swap blocks of random sizes together. Usually the group I play with has colour suggestions for backgrounds but it is interesting to see what can be seen as sky blue by different eyes. Such a treasure to cherish! Oh! This is the best quilt ever! I just love that so many wonderful people contributed and that you have a happy town to look at. It will make you smile every time you see it or use it! The houses are full of warmth and kindred spirits from all of us to you. 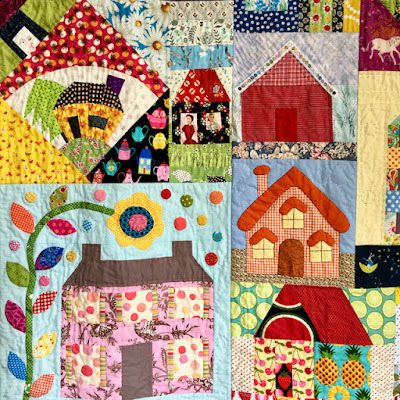 The finished quilt sends all that joy right back to us. Thankyou for the opportunity to be part of the family. 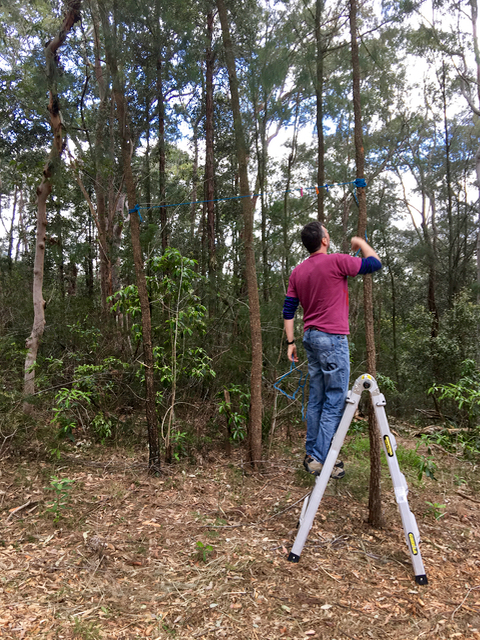 Hi to the offsider on the ladder. Absolutely charming! 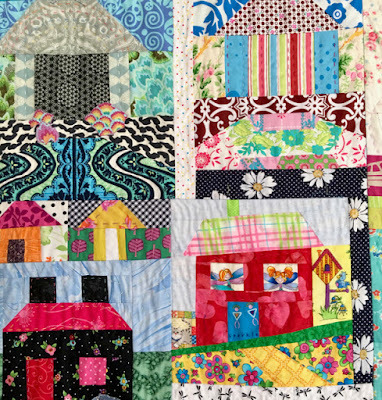 I just adore this quilt. 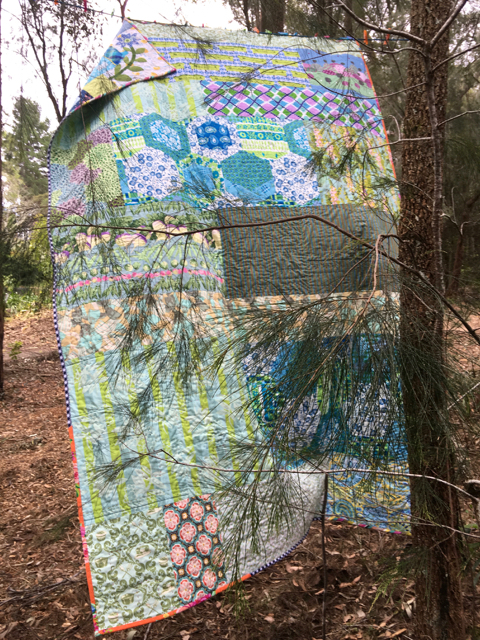 And why is it that the wind always comes up when you want to shoot a quilt? I love pieced backing too and this one is superb. Thanks for sharing this adventure. I have enjoyed reading and viewing this one! what a wonderful quilt! I loved reading why you put certain houses where you put them: so fun to see the relationships! And what a sweet husband!! both he AND your quilt are charming!! And I think you should name your real house "The House at Fairy Hollow" because it's where magical things happen!! Daisytown is magnificent - front and back, full of homes of love. You are a lucky lady Ms Daisy. Daisy Town is delightful!! I'm so glad we got to see all the blocks separately first, before finally seeing how you puzzled them all together. The joining strips really make a nice feature to tie all the styles together. I just love your quilt! A wonderful quilt... so busy and colourful! 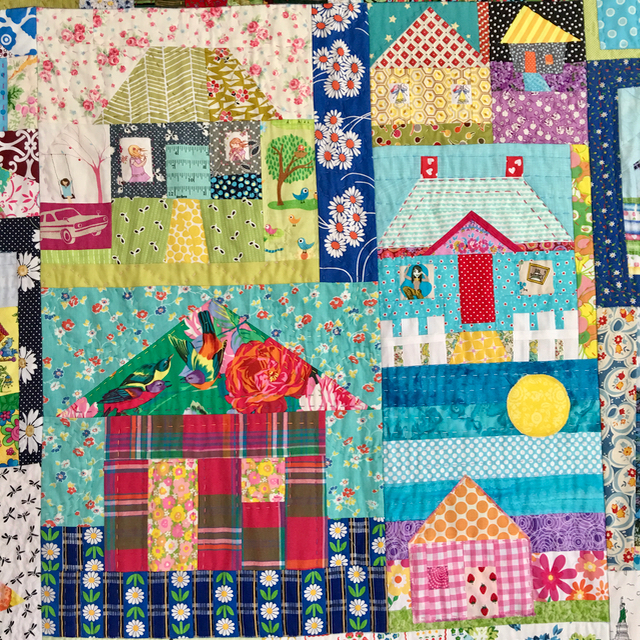 It would have been a fun challenge getting all the blocks together, and I love how you've added your own special touches with your hand quilting! What a wonderful neighborhood filled with friends! I love the final result and the houses all play so nicely along side each other. What a wonderful quilt story full of memories. The backing is perfect. Thanks for all the great close up photos too, I've enjoyed every single one of them! Happy is just in time for grandma O'Quilts...I know that home is where the heart is!!!! I see lots of love in that wonderful quilt. The finished quilt is just fabulous. 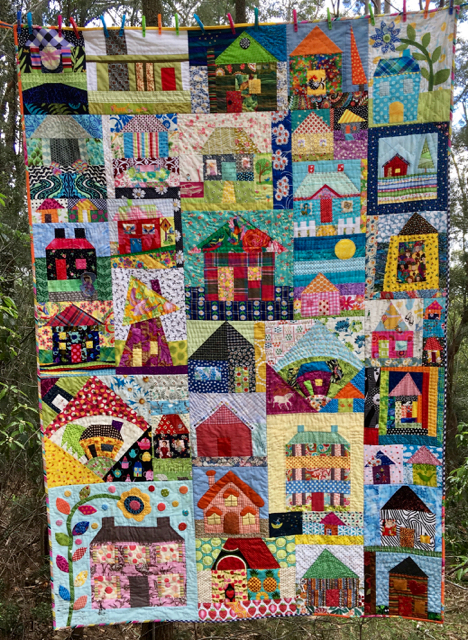 Everyone who contributed house blocks must be thrilled to see what a marvellous quilt you have created from the jigsaw pieces of individual houses. Love the pieced backing too. Yippee! Daisy Town is awesome! So perfectly you with all the fun stitching, too! Love it! Thanks for letting us all have a place in Daisy Town! Sweet! 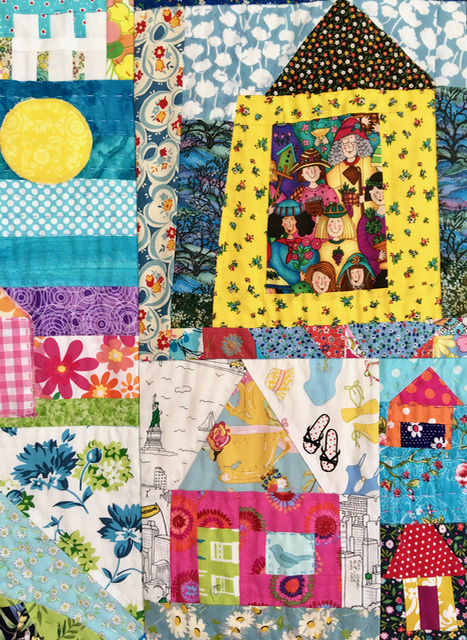 It's a lovely and happy quilt Rachael ! With so many stories to tell. I love your pictures among the trees. It is lovely to see all the houses together. It is such a wonderful end result. They are all so different but you have worked your magic and turned them into a neighbourhood. Love the fun backing too. Of course it has to be shown off. You have come up with the perfect name for the quilt. You can't help but feel happy when you look at it. I think it is also one of those quilts in which you will see something new every time you look at it. And, yes, you have to love a husband that will go to those lengths for his wife's joy. 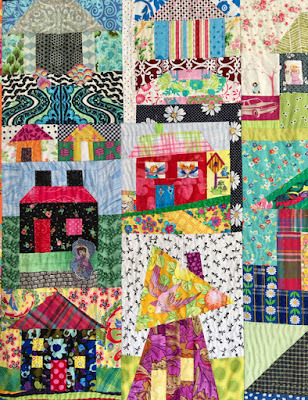 Thank you for your stories about this delightful quilt. It's been lovely having a wander around Daisy Town with you as our guide. F A V O L O S A ! ! ! It came together so beautifully. It was a good idea to show the house blocks separately, that way we could see and appreciate all the details. A lovely quilt to cherish for the years to come!! 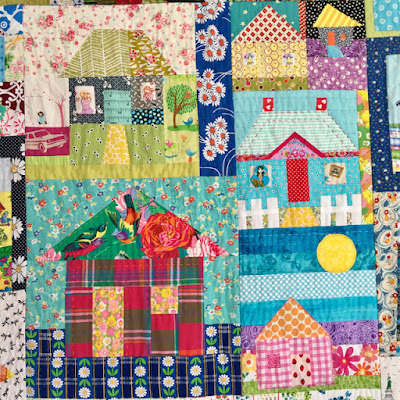 I've loved this tour through quilttown with Mrs Daisy. Thanks you, it's a glorious, fabulous quilt. Love your houses quilt Rachael. It'ss gorgeous. Cant wait to see it in the flesh! 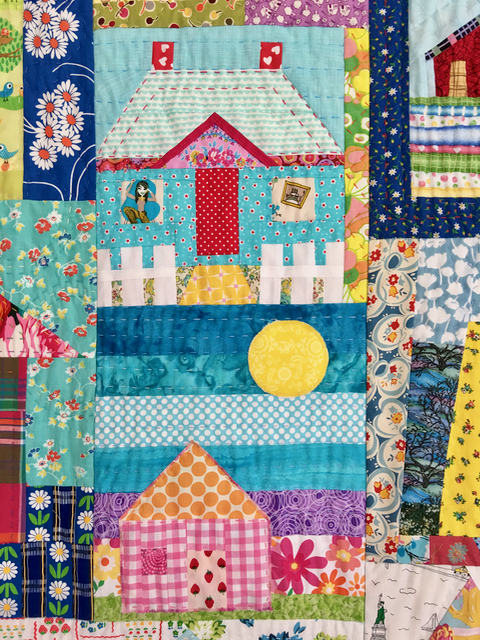 Wow, what a wonderful happy quilt, you clever cookie. This is a wonderful quilt. I think your decision to keep it simple was spot on!